Experience and explore these romantic places in Hyderabad with someone special by your side: 1. Ramoji Film City A date with love in a fancy restaurant in a white bungalow enveloped in tranquillity and serenity that overlooks the 'Secret Lake' of Hyderabad is bound to be special. A rustic hideaway where the blend of ambience and décor will transport you to the Mediterranean hues. Add a twist to your date with an exotic cuisine paired up with some of the best wines. The sun-drenched cobblestone alleyways are the perfect place to pull off the grand gesture for the special someone. Timings: 7:00 PM to 11:00 PM. Ask any self-respecting Hyderabadi what their favourite dish is and they’ll probably say biryani. That being said, the City of Pearls has got plenty of other culinary tricks up its sleeve, and anyone willing to look beyond the biryani (but not overlook it entirely, because, well, that’s sacrilege) will find a plethora of cuisines and dining styles to suit every palate. So to help you navigate the many flavours of the city, we’ve put together a list of some of the best restaurants in Hyderabad (in no particular order). These cover everything from authentic Hyderabadi and Andhra cuisines to Asian and even Polynesian food. If you’re planning a visit soon, we advise wearing pants with an elastic waist. 1. Chicha’s Get a side serving of Hyderabadi Urdu with your food at Chicha’s, one of the quirkiest restaurants in Hyderabad. The heirloom recipes have been passed down the generations, and come from the oldest Muslim households in the city. This means you can expect meat. And lots of it. The patthar ka gosht – tender mutton marinated overnight and cooked on a hot granite slab over charcoal – holds top honours on the menu, and a close second is the shaadi ka red chicken – a spicy, smoky number that’s a staple at any local wedding – followed by the tender talawa gosht. Don’t leave without trying the double ka meetha: the Hyderabadi version of bread pudding. Address: 6-2-39, opposite Kun Hyundai, Lakdikapul (040-66567890) 2. Hotel Shadab Do breakfast the Hyderabadi way and consume your calories early on in the day. At Hotel Shadab, join the ranks of locals who flock here for a bowl of the delectable nihari – a slow-cooked stew of the choicest pieces of mutton – with a little bone marrow thrown in for that extra punch. This is had with shirmal: a type of bread with a slightly sweet flavour that goes well with the spiciness of the nihari. If you’ve got the room, the mutton biryani should be next on your list. And finally, wash it all down with a glass of Irani chai, a tiny cup of pure, saccharine bliss. Address: 21, opposite Madina Building, High Court Road, Ghansi Bazaar (07809766659) 3. Chutneys This one’s one of the rare all-vegetarian restaurants in Hyderabad and if it can make its mark in a meat-loving city, you can be sure it’s pretty darned good. With all the regular South Indian suspects like idlis and dosas, Chutneys’ ace in the hole is its… chutneys. All six of them. So good are these humble accompaniments to the main dish that diners are often spotted eating them by the spoonful. But since showing up to just eat chutney is rather ridiculous, we recommend ordering the soft and fluffy Babai Idli served with a dollop of fresh white butter. The paper-thin Plain Dosa, akin to a conical party hat, is also great to mop up the chutney with. Address: Shilpa Arcade, Rd No 3, Banjara Hills (040-23358484) 4. Conçu and Conçu Cucina The swanky little patisserie Conçu and its sister restaurant Conçu Cucina are the brainchild of Swati Taneja and her husband Sahil, a pastry chef who’s doing everything right. The gourmet desserts are some of Hyderabad’s finest and include showstoppers like the Russian Medovick, macarons in exotic flavours like Baiser with passion fruit and tonka bean ganache. At Conçu Cucina, you can expect Italian food that will make you feel like you’re in a little cafe in Tuscany. The herbs are grown in-house and are used to prepare authentic fare like the Chicken Cannelloni, made with Cucina’s artisan pasta, and the Mushroom and Scamorza Risotto, another must-try. Address: 738, Road Number 37, Jubilee Hills (09985800031) 5. Shah Ghouse What Shah Ghouse lacks in décor it more than makes up for in flavour. Greasy tables and time-worn (read: blackened) walls aside, this Hyderabadi institution in the heart of Old City has been around for so long for one reason: its biryani. The Special Mutton Biryani comes in a copper bowl that’s piled so high it defies the laws of gravity. When paired with dahi ki chutney and mirchi ka salan, the biryani takes on a whole new level of fantastic. Insider tip: if you happen to be in Hyderabad during the holy month of Ramadan, Shah Ghouse makes some of the best haleem in town. Address: Syed Ali Chabutra, Shalibanda (09392447098) 6. Haiku As the sunlight streams into the airy dining space at Haiku, creating the perfect lighting for a profile picture, one is inclined to wait patiently for the food to come. Haiku does pan-Asian food that isn’t just delicious, it’s also MasterChef level chic. The Singaporean penang laksa (in veg and non-veg) is a heady concoction that’s great for clearing up blocked sinuses, and the salt and pepper water chestnuts are a treat. Haiku also does some really good teppanyaki and sushi, if you’re in the mood for Japanese. Try the crazy maki. Address: Above Kaficko, opposite Volvo, Banjara Hills Rd #12 (07095876111) 7. Kabul Darbar Deep within the dimly-lit dining room of one of the first Afghani restaurants in Hyderabad, black pathani-clad waiters bring out your food cooked by real Afghan chefs. If you try just one thing here, let it be the mutton rosh. Cooked for four hours in a secret mix of spices, the meat slides off the bone. Pair that with some rich Afghani naan and you’re golden. If you’re visiting in a large group, the mutton mandi will serve you well. Succulent, tender meat is served on a steaming bed of flavoured rice. Address: 9-4-77/3/12, Old Mumbai Highway, Yousuf Tekri, opposite RTA Office, Toli Chowki (040-65583888) 8. Prost Brewpub One of the first microbreweries in the city, Prost was destined for great things. Set up by a bunch of IITians, the Bangalore-based pub was brought to Hyderabad only a few years ago. The head brewer can sometimes be seen by the brewing machinery tinkering with the Belgian barley that is used in the beer here. Try a tasting platter for a teaser of the in-house beers like the Cider Rider and Hyd Hurricane. The buffalo wings go well with the beer, as do the overloaded nachos and the thin crust, hand-rolled, wood-fired pizzas. Address: 882/A, 45th Rd, 45th Rd, Masthan Nagar, Silent Valley hills, Jubilee Hills (040-23556235) 9. The Pavilion-Drive In Perfect for a round of post-clubbing bingeing, The Pavilion-Drive In is open till 4 am and serves a bunch of different kinds of food – from Indian and Italian, to Chinese. Although the vibe is reminiscent of a highway food-court (you know, like the ones on the way to Lonavala), the food more than makes up for it. The chicken gongura pulao at Pulao Paparao is tangy and satisfying, and the BBQ chicken pizza at Grab Italy is a treat. Address: Plot No 1014/C, Rd No 51, Jubilee Hills (07702441470) 10. Olive Bistro Hyderabad’s Olive Bistro belts out some top-notch Mediterranean and continental food. The restaurant looks out over Durgam Cheruvu lake, making it the perfect place for a sundowner. Try the Moroccan-inspired prawn and charmoula spiced with smoked butter, the slow braised lamb, and pork belly rice. Round it all off with an OB Insanity Cake slice, and while you’re there, hop over to The Hoppery, the on-site lounge, which is set inside a glass house and serves up brews. Address: Road No 46, Jubilee Hills, At Kona’s Durgam Cheruvu (040-69999127) 11. Jewel of the Nizam – The Minar Opulent, turquoise-themed décor and gorgeous views aside, this is one of the restaurantss in Hyderabad that takes fine dining to a whole new level — quite literally, since it is 100ft in the air. It serves classic Hyderabadi delicacies like varqui lukme, a flaky pastry stuffed with mince; marag, a reduced lamb broth; and the famous Hyderabadi khatti dal. End it all with khubani ka meetha, a stewed apricot dessert. Address: The Golkonda Resort, Gandipet (040-30696938) 12. Syn Asian Grill & Bar Some might scoff at the thought of great Japanese food at a five-star hotel, but Syn debunks any such theories. There’s a live sushi and teppanyaki counter in the middle of the restaurant so you can watch what you eat, and if there’s one place to safely try the sashimi in a landlocked city like Hyderabad, it’s here. Try the dynamite maki, orange blossom maki, the Mexican roll, and give the fried prawns sesame on sticks a whirl. Address: Taj Deccan, Road Number 1 (040-66523939) 13. OTM – Over the Moon OTM is probably one of Hyderabad’s most-loved bars, and parties go on until the wee hours of the morning. The food here gives it an edge over the other joints in town, though. The Cajun paneer skewers with walnut pesto are great to start things off with, followed by the lamb chops served in a red wine reduction. The buffalo chicken pizza is another hit. Insider tip: visit at dinner time and watch the sun set over the city from the rooftop restaurant, then hang out until the party really starts. Address: 8th Floor, Daspalla Hotel, Road No. 37, beside Bajaj Electronics, Jubilee Hills (07032686862) 14. Celeste Call in advance and book yourself some afternoon tea at Celeste, the Mediterranean and continental restaurant. You will be given a tour of the palace, once owned by the Nizam, and will then be treated to an elaborate spread of exclusive snacks like canapes and mini sandwiches. The assortment is always changing but they get it right every single time. Address: Engine Bowli, Fatima Nagar, Falaknuma (040-66298585) 15. Fat Pigeon This is where all the cool kids go before they head out for a night of heavy partying. The laidback vibe and live music performances on Fat Pigeon’s upper deck make the perfect setting for a chilled-out evening. Appetizers here are the thing to order, so go wild. The cheddar and mozzarella cheese balls, Cajun batter-fried fish and murgh kofta kebab are crowd favourites, and you just can’t miss grilled chicken sandwich pizza here. Address: 1335/A, Rd Number 45, Jubilee Hills (09100666101) 16. The Roastery Coffee House No prizes for guessing what the star of the show at The Roastery Coffee House is. Started by a couple of coffee lovers, the cafe’s signature coffee is their cold brew — a non-acidic decoction where the beans are brewed overnight in cold water. Their other bestsellers, made from single-estate coffee beans, are the Monsoon Malabar Pour Over, the Cappuccino and their Affogatos. They also make a mean chicken southwest burger and buffalo mozzarella roasted Vegetables, for when you get snacky. Address: 18, 8-2-287/12, Road Number 14, BNR Colony, Venkat Nagar (06309590610) 17. Wai Kiki While the ambience at Wai Kiki doesn’t exactly scream tiki bar (no floral motifs or coconut skirts here), the Polynesian food will definitely transport you to an island in the Pacific Ocean. The menu is limited, but the portions are huge — a nod to the Polynesian culture of family bonding over a shared meal. Try the island tidbits, a generous-sized platter with cheese balls, pork strips, crab Rangoon, and chicken satay, and the Polynesian Princess, a chicken, shrimp and vegetable concoction infused with a strong coconut flavour. Address: Miyapur Road, Chhota Anjaiah Nagar, Gachibowli (040-67696769) 18. Dum Pukht Begum’s Lorde got it right. We’ll never be royals. But that doesn’t mean we can’t eat like them once in a while. With recipes from the kitchens of Hyderabad’s oldest royal families, Dum Pukht Begum’s makes a case for eating dinner like a king. Many of the dishes, like the subz purdah, shahi nehari, and the iconic dum pukht biryani are slow-cooked in a sealed vessel – a method that enhances their flavours tenfold. And if you aren’t feeling lavish enough yet, for dessert try the Badshah Kulfi pasand topped with gold leaf. Address: Madhapur, ITC Kohenur, HITEC City (040-67660101) 19. Flying Spaghetti Monster Once you’re done giggling at the menu – the Seinfeld references will have you chortling out loud – you can turn your attention to the delicious food at the table. The Italian cuisine at Flying Spaghetti Monster is satisfying in a ‘made with love by Nonna’ kind of way. A lot of the ingredients are sourced all the way from Italy, and in dishes like the Salsa Jalapeño, Lasagne Napoletana and the Risotto Panna Picante, you can tell there’s a little something special in there. Address: 5, Road no 3, Banjara hills, Beside IndusInd Bank (09966866652) 20. Palamuru Grill Carry a handkerchief for this one. In true Telangana style, the food here takes things to a level that puts the Scoville scale to shame, so runny noses are par for the course. But though the food is spicy, the flavours still manage to find their way through. A good place to start is the kebabs, grilled right in front of you. Next, try the mutton Dhal Cha, a luscious daal infused with the intense flavour of well-cooked meat. After these teasers, you’ll be ready to graduate to the Natukodi Stoneage Pulusu, one of Palamuru’s finest. This spicy fish curry is cooked in stone pots to recreate the flavours of the village where the recipe originates. Address: 50, Ayappa Society, 100ft Rd, opp Meridian School, Madhapur (050-69990029) 21. Ohri’s Tansen If you can dine out at one the best restaurants in Hyderabad with a view of the iconic Hussain Sagar lake, consider it killing two birds with one stone. At Tansen – a Mughlai joint that’s part of the true-blue Hyderabadi chain of Ohri’s restaurants – you can do just that. Hot favourites here are the paneer dum roll, the ghee roast murgh cooked in Mangalorean spices, and the Maharashtra-inspired Saoji gosht. For dessert, try the creamy basundi or the Ohri’s Special Jawzi Halwa – a revived Nizami recipe. Address: Ohri’s Jalavihar, Necklace Road (09866770504) 22. Ciclo Café India’s first cycling café chain, Ciclo Cafe offers much more than great food. Browse through some state-of-the-art bicycles and cycling equipment on the ground floor and make a mental note to exercise more and eat healthy before you head upstairs to the café and forget all about that. The kaffir lime chicken tikka, Cajun baby potato, lasagne lamb bolognese, the seekh kebab and the nachos are superlative. And then, if you start to feel guilty about eating everything in sight, you can consider cycling home. Address: 801, Rd Number 36, CBI Colony, Jubilee Hills (07995991111) 23. Van Lavino If you believe that dessert can be an entire meal and chocolate is a salad, then the folks at Van Lavino would be inclined to agree. A dessert café that specialises in all things sweet, it’s the crêpes here that have been gathering the masses. There’s a very short window, though: the live crepes are only served between 11 and 11.30am. They serve other snacks as well because not everyone subscribes to the same faith, so if you need a break from the sugar, a classic alfredo pasta will suit the cause. Wash it all down with a nice Hot Chocolate that’s served with a couple of fluffy marshmallows and then start the debauchery all over again with a bubble waffle, another current favourite. Address: 4, Road No 36, Jubilee Hills (040-23559770) 24. Churrolto As the name suggests, Churrolto belts out some of the best Spanish churros in town. The restaurant is a little small, so you may have to wait to be seated. But you’ll soon find that it’s worth it. The churros, covered in a fine cinnamon-sugar dust, are served hot and crispy with your choice of dip — you’ll be tempted to pick the Dark Nutella but we recommend the Espresso Choco Sauce. Taking your lover on a dinner date can be one of the most romantic gestures this Valentine’s Day. There are myriad awesome restaurants in Hyderabad where love birds can spend some quality time amidst great ambience and soothing settings. You can revive your romance with some fine wine and amazing food at these splendid Hyderabad restaurants. Check out our list if you are looking for a heart warming Valentine’s Day meal with your beloved: TOI-Online | Updated: Feb 13, 2018, 23:55 IST Taking your lover on a dinner date can be one of the most romantic gestures this Valentine’s Day. There are myriad awesome restaurants in Hyderabad where love birds can spend some quality time amidst great ambience and soothing settings. You can revive your romance with some fine wine and amazing food at these splendid Hyderabad restaurants. Check out our list if you are looking for a heart warming Valentine’s Day meal with your beloved: Little Italy This Valentine, surprise your lover by taking him/her to Little Italy where they can relish authentic Italian cuisine. From ambiance and food to rooftop settings, this restaurant is just perfect for a romantic dinner date. The music is another highlight of the place that will make your evening all the more memorable. Table reservation is recommended. Address: 3rd Floor, BK Towers, Near Cyber Towers, Hitech City, Hyderabad Phone: 040 39999500 Tansen Located on Necklace Road, Tansen has the ideal setting for Valentine’s Day date night. The place definitely has some romantic magic to it. With magnificent lotus sculptures and beautifully carved pillars, this restaurant looks like a dream that every romantic couple would love to be in. Just make sure to book a table well-in-advance. Address: Ohri's Jalavihar, Necklace Road, Hyderabad 500068 Phone: +91 9866693539 Okra Okra is one vibrant and happy restaurant which is just perfect for Valentine’s Day lunch date in Hyderabad. Placed inside Hyderabad Marriott Hotel, this restaurant is known for is live cooking station and classy ambiance. Couples can relish a wide array of Continental, North Indian, Chinese and Hyderabadi dishes. Address: Hyderabad Marriott Hotel & Convention Centre, Opposite to Hussain Sagar Lake, Tank Bund Road, Hyderabad 500080 Phone: 040 27522568 Kanak Bringing your beloved to Kanak on Valentine’s Day will most definitely be one of the best decisions of your life. With Ustads playing gazhal and stunning interiors and delicious food, this restaurant winn hearts on various levels. For those seeking a secluded and romantic place to dine in Hyderabad on VDay, Kanak is just for them. Zafran Exotica Restaurant and Bar Zafran Exotica Restaurant and Bar in Banjara Hills, Hyderabad is known for its gorgeous romantic settings and delicious Mughlai, North Indian and Chinese food. The place will definitely make your partner happy with its classy interiors and mouth watering food. Book your table before! Share on Facebook Share on Twitter Refrain from posting comments that are obscene, defamatory or inflammatory, and do not indulge in personal attacks, name calling or inciting hatred against any community. Help us delete comments that do not follow these guidelines by marking them offensive. Let's work together to keep the conversation civil. The best gift which you can give to your partner is your “TIME” Are you planning a romantic dinner for your special one? Then you have landed on the right page to choose the best place. We all have craving for delicious food and of course when it comes to a date we want to make it memorable for our special ones. Dinner dates are the major part of love celebrations. Whether it is a new or old couple, all want to spend some romantic time with their partners out of their busy schedule which keeps their relationships fresh and deep. Romantic dinner dates are cherished by everyone. So when it comes to planning for a dinner then you must read below and can filter out the best restaurant for your date in Hyderabad which is a beautiful city. From my experience, I have filtered out the best 5 romantic restaurants in Hyderabad. Dil Punjabi: Location: 1st Floor, Inorbit Mall, Madhapur, Hyderabad. Best Romantic Restaurants in Hyderabad A look of superb vegetarian starter: Paapri Kurkure A look of superb vegetarian starter: Paapri Kurkure As you step in the restaurant, you will be treated as a very special guest and would be welcomed with a positive smile from the management team. The Restaurant is based on the “aqua” theme. As aqua means “royal water” and water signifies life so having food in this restaurant is adding an extra happiness to your life. Hanging and shining dim lights make the ambience very romantic. Another thing which you will notice is a light music of classy Hindi instrumental songs which fits with the ambience. Those classy instrumental songs will just touch your heart and could impress your partner. Dil Punjabi is famous for their amazing north Indian and Mughlai food. Most of their dishes are mouth-watering. The best part is that while your order is getting ready you can chill out, relax and enjoy those romantic songs with your date. If it is your first date you can even propose your special one and I am sure you will be able to win her or his heart because we all love to have good quality food and Dil Punjabi is one those restaurants which serves the best north Indian food. From my personal experience, I can say this place has the best food in this cuisine. If you have never been to this restaurant then this is the time. Go and enjoy your dinner date with your partner. Exotica: Location: 12th Square Building, Road 12, Opposite Audi Showroom, Banjara Hills. Best Romantic Restaurants in Hyderabad If you want to chill out with drinks and food then this may be a good option for you. 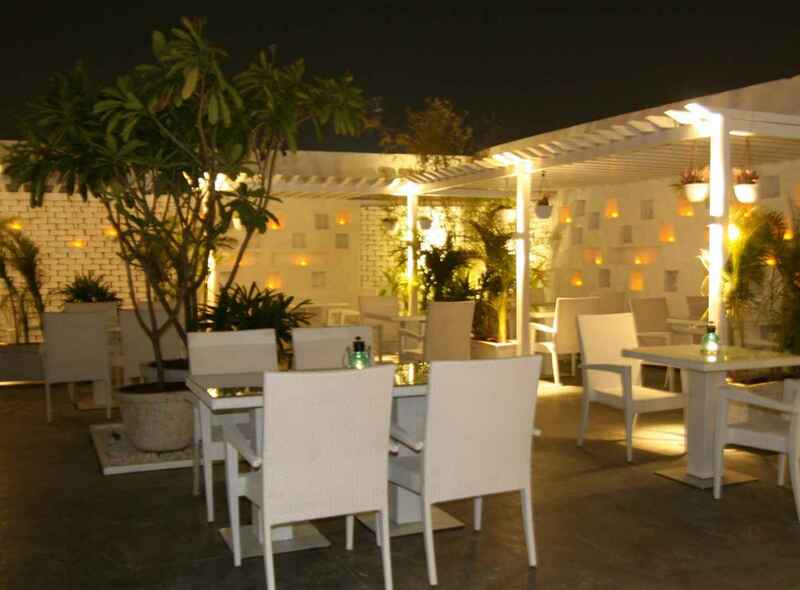 Hyderabad has quite a few good rooftop restaurants, and this is definitely one of those! The decor is quite meticulously done, and the overall ambience matches the theme. Here you can see an aquarium which looks so beautiful and you can enjoy seeing the fish till your order arrives. The place is really a romantic place as we can sit outside and inside both. Actually here you can get good appetizers, kebabs, curries, oriental appetizers and mains. If your partner is upset with you, then this place could be a good option where you can share your real feeling of love to your partner and make them happy. I am sure you will get a heavenly feel at this place. Prego @ Westin : Location: Westin Hotel, Mindspace, HITEC City. Best Romantic Restaurants in Hyderabad If you and your partner have craving for Italian food, then this is an excellent option you have. Westin, the name itself sounds so rich. It has chains all over the world and is one of the top 5-star hotel and resort. Westin has many restaurants in it. Prego is an Italian restaurant. They have a live kitchen. You can also enjoy your food being made in an orderly and hygienic fashion. You may also choose to sit in an outside area near the pool where you can relax and can spend valuable moments with your partner. The staff is very courteous and will always welcome you with a smile. In the outside area, the ambient lighting indeed has done its job in making the lounge look comfortable and soothing. There are a lot of varieties of Italian food with an impressive array of scotch. The summer evenings would definitely add a great touch to your dining. Olive Bistro: Location: Road No. 46, Jubilee Hills, At Kona’s Durgam Cheruvu. Best Romantic Restaurants in Hyderabad In the midst of “secret park” situated with elevated steps and is a rooftop setup. This is featured for Italian cuisine. Could anyone think how gorgeous this place could be? Yes, Olive Bistro has one of the beautiful ambiences with flowers and pretty chandeliers. It is a rusty bistro with white walls and flowered cobblestone. Yes, this place is designed especially for dinner dates with your partner. This is actually a romantic place. The menu holds a lot of options from starters to the mains (Italian). The overall ambience and lovely food will make you feel very cozy and romantic. A must visit place. La Cantina@ Novotel: Location: Novotel Hotel Road, Near Hitec City, Kondapur. Best Romantic Restaurants in Hyderabad Best Romantic Restaurants in Hyderabad Best Romantic Restaurants in Hyderabad I can assure that you will enjoy the poolside candle light dinner. For lovers of Mexican cuisine , La cantina is one the best destination. The indoor area has a typical Mexican décor; they have items from Old Mexico. To spend your precious time with your partner you may choose to sit near poolside in outside. You can enjoy the cool breeze from the pool and you can experience silent fresh atmosphere. They will serve you the Mexican food garnished attractively. Their drinks menu holds a lot of good options. So friends keep dating with your partners and enjoy your one and only precious life. Life holds valuable moments, so don’t let it go. Keep enjoying. Best Dining in Hyderabad, Hyderabad District: See 48,229 TripAdvisor traveller reviews of 5,953 Hyderabad restaurants and search by cuisine, price, location, and more All Hyderabad Restaurants. Popular Types of Food. American Restaurants with Buffet in Hyderabad. Cafés in Hyderabad. Chinese Restaurants in Hyderabad. Fast Food Restaurants in Hyderabad. Halal Restaurants in Hyderabad. Indian Restaurants in Hyderabad. Romantic dinner dates are cherished by everyone. So when it comes to planning for a dinner then you must read below and can filter out the best restaurant for your date in Hyderabad which is a beautiful city. From my experience, I have filtered out the best 5 romantic restaurants in Hyderabad. Dil Punjabi: Location: 1st Floor, Inorbit Mall, Madhapur, Hyderabad. Best Romantic Restaurants in Hyderabad. A look of superb vegetarian starter: Paapri Kurkure. A look of superb vegetarian starter: Paapri Kurkure. As you step in the restaurant, you will be treated as a very special guest and would be we . Check out these romantic restaurants in Hyderabad for that lovely time the two of you are seeking This is one of the best luxury hotels in Hyderabad. If you love nightlife and would like to chill out in the evenings with your loved one, you can try out the Casual Dining & Lounge Bar at the hotel. With its comfortable lounge-style sofas and a variety of cocktails to choose from, you can sit back and relax savoring the delicacies and listening to some really good music. 5. Ideal Candle Light Dinner. Where: Banjara Hills. Unlike other restaurants on this list, this one is for those of you whose ideal romantic date is having a very casual meal and a great conversation. 6. Exclusive Dinner.